Release grief & anxiety from the heart and live with more freedom? Learn to work the ‘organs of action’, our arms & legs, to stimulate, strengthen and support our inner organs? If so, you’re in luck, Louisa Potter is returning after the successful April weekend workshop at Wellington Yoga Centre for another workshop. Louisa is trained in Iyengar yoga, and some background in this style of yoga is needed for attendance. 5 hours per day with 2 hour lunch. Full workshop price: $120. You can come to half days for $30. Louisa Potter has been teaching for 20 years, and been practising Iyengar Yoga for 26 years. Currently she holds a JI 3 Iyengar Yoga Certificate. She has studied six times with BKS Iyengar (Guruji) and/or his daughter Geeta (Geetaji), to whom she is eternally grateful for their wisdom, knowledge and inspiration that they have imparted to the art of Yoga, which enhances the gift of life. 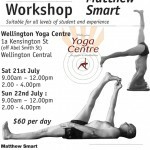 Iyengar Yoga Workshop with Matthew Smart, at the Wellington Yoga Centre. Matthew is a highly regarded teacher, and has been practicing for 27 years. He brings a broad understanding with a light-hearted and enthusiastic approach to his teaching. 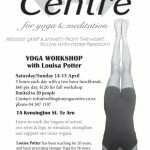 Louisa Potter is an Iyengar teacher with over 20 years of teaching experience. She has been to India to train with BKS Iyengar or his daughter six times. Louisa is coming to Wellington! This is not to be missed if you have even a little Iyengar knowledge.